These day trips from Athens are all great suggestions if you find yourself with extra time in the Greek capital. Take your pick from visiting beaches, UNESCO sites, Greek islands and seeing a memorable sunset. With its abundance of things to see and do, Athens is a great place to visit during your vacation in Greece. It is also ideally positioned so you can reach a number of important historical sites in Greece on day tours from Athens. Are you looking for some interesting day trips from Athens, because you want to see different parts of Greece? This article is just for you! I have put together some of the most popular and interesting excursions around Athens, along with all the information you might need. Cape Sounion and the Temple of Poseidon. A day trip to Delphi. Greek island day trips to Hydra, Poros and Aegina. All of these day trips from Athens can be made independently or by organised tour. If you have some days free and want to combine a few of these trips, you could do it yourself by hiring a car in Athens. This will most likely work out cheaper and more convenient for 3 or more people travelling together. If you only have a day free though, it will probably be easier to book a tour in Athens. I have included details for both cases. This is one of the most popular day trips from Athens, and for good reason. Not only do you get to visit a magnificent Ancient Greek temple, but you see an amazing sunset as well. Many people choose to visit Cape Sounion and the Temple of Poseidon as an afternoon half-day tour from Athens. The drive there takes you along spectacular coastal roads, and you may even find time to spend on a beach. By arriving at the archaeological complex an hour or so before sunset, you can take a look around the temple, and then watch the sunset. It's a very memorable trip! You might also be interested in: A full day private day tour in Athens including trip to Sounion – Click here. Do the Sounion tour independently: Read more about how to visit Cape Sounion. Delphi was one of the most important areas in Ancient Greece, and is also one of the most visited archaeological sites today. A day trip to Delphi will take in the Temple of Apollo and the museum, and usually pay a visit to the town of Arachova. The UNESCO site of Delphi has an important place in Ancient Greek mythology and history. The site of the famous oracle, it was also thought to be the navel of the world. Today, the remains of temples, stadiums and theatres can be seen, as well as stunning views of the surrounding countryside. The Delphi Museum is also magnificent, and it's essential to visit here as well to fully understand the site. 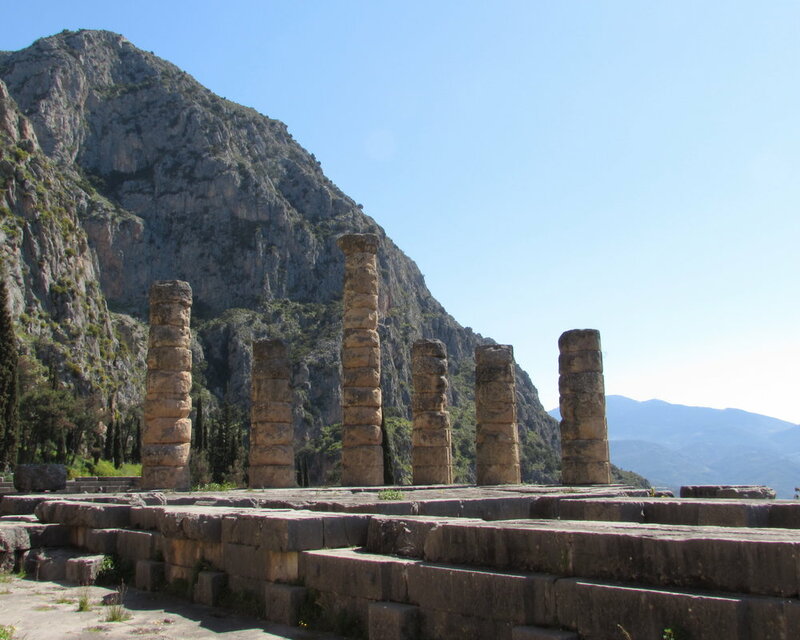 Visiting Delphi With A Tour: Visiting Delphi is one of the most popular day trips from Athens. There are a number of tours available, most of which are priced around 90 Euros. Visiting Delphi Independently: The best way to visit Delphi would be by car. You can find information here about hiring a car in Athens. I have previously written an article about Delphi which you can read here – Delphi. You can also find out about My Big Fat Greek Road Trip! The Greek islands are all individual, unique and special. Although many of them are not reachable on day trips from Athens, these three are. Visiting them will give you a taste of what the Greek islands are all about. 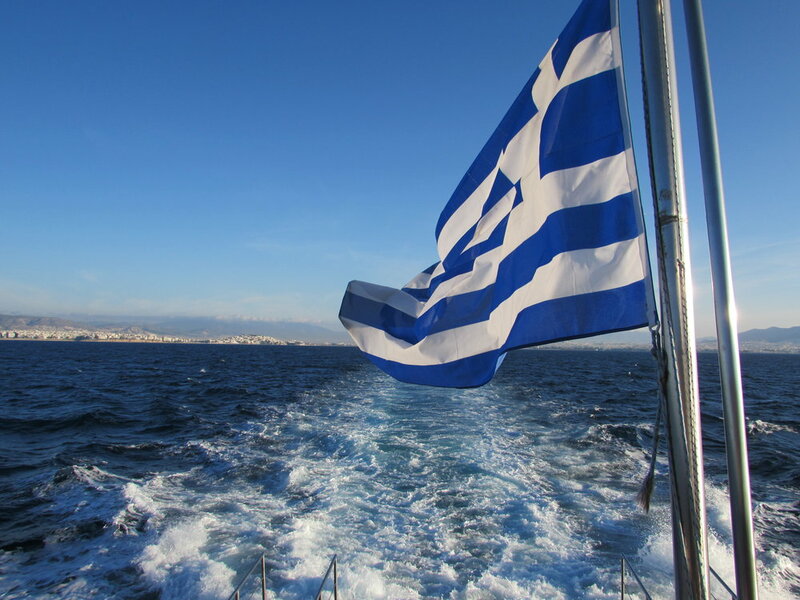 This trip is sometimes known as the classic ‘3 Islands cruise from Athens‘. A day trip from Athens to the nearby islands of Hydra, Poros and Aegina is ideal for anyone who is visiting Greece, but who is unable to travel to any of the other islands. They give a taste of what life is like, the architecture, and the people. Visit the three islands on a tour: By far the easiest option. There are plenty of tours available, of which this is a good example – Three islands tour from Athens. Pro Tip – Prices on board these ferries for soft drinks and food are very high. I suggest you bring plenty of your own water for the day trip. Visit the three islands independently: It is possible to do this, but is probably going to be a pain for most people. A combination of different ferry times, prices, and ever increasing ferry strike action makes it a hassle you probably don't want on your vacation. You can read more about my experiences visiting these islands here – Three islands day trip from Athens. Yes, this was on an organised day cruise! Of all the possible day trips from Athens, I think this one offers the most value in terms of what you can see during one day. Starting from Athens, you would drive out to the Peloponnese, and most likely stop at Corinth Canal along the way. After that, you would continue on to the ancient sites of Mycenae and Epidaurus, before reaching the pretty town of Nafplio. This day trip is a must for anyone who is interested in Ancient Greece. The archaeological site of Mycenae is arguably the birthplace of Greek civilisation, being the most important centre during the bronze age. The incredible walls still amaze to this day, due to the sheer size of the rocks used. Epidaurus is also a very important place, known mainly for the unique acoustics in the theatre. You can quite literally hear a pin drop! The Healing Sanctuary of Asklepios at Epidaurus is also a must visit when on the site. This acted as a place of pilgrimage for people seeking cures from ailments. People from all around the ancient Greek world and beyond would travel here to be healed! Finally, Nafplio is often cited as the prettiest town in Greece. You will see why when you visit! Take a Tour: Taking a guided tour is probably the best way to experience these places if you have limited time. Find out more about visiting Mycenae, Epidaurus and Nafplio on a guided day trip from Athens here. Visit Independently: You are going to need to hire a car to do this day trip by yourself. Personally, I would visit the three places, but choose to stay overnights at Nafplio. 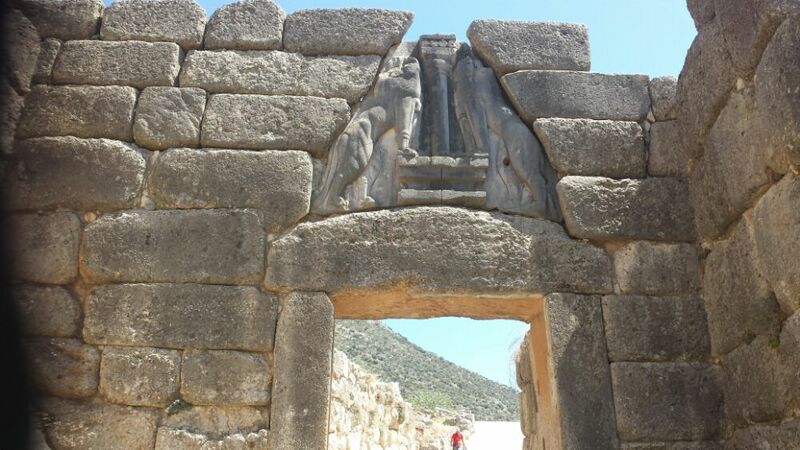 You can read about my experiences in Mycenae here. This is one of the longer day trips you can take from Athens, but certainly worth the effort. 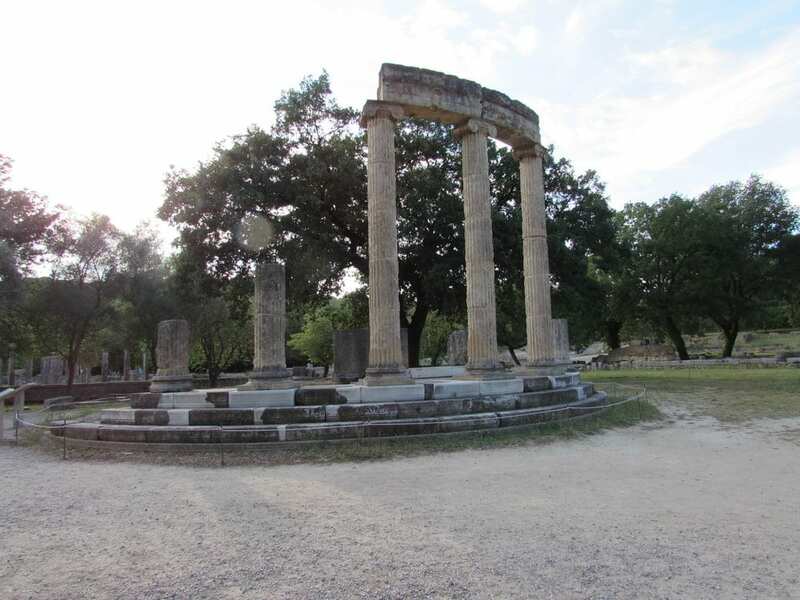 Ancient Olympia was of course the home of the original Olympics, thought to date back at least 3000 years. It's an impressive archaeological site, and remarkable to think that ancient Greek city states would have a truce period so their athletes could travel and compete there! Take a Tour: Due to the distances involved, this is really only possible when taking a private tour as opposed to a group tour. It's also more expensive of course! Still, if this is the only way you can see one of the most important archaeological sites in Greece, it's worth considering. 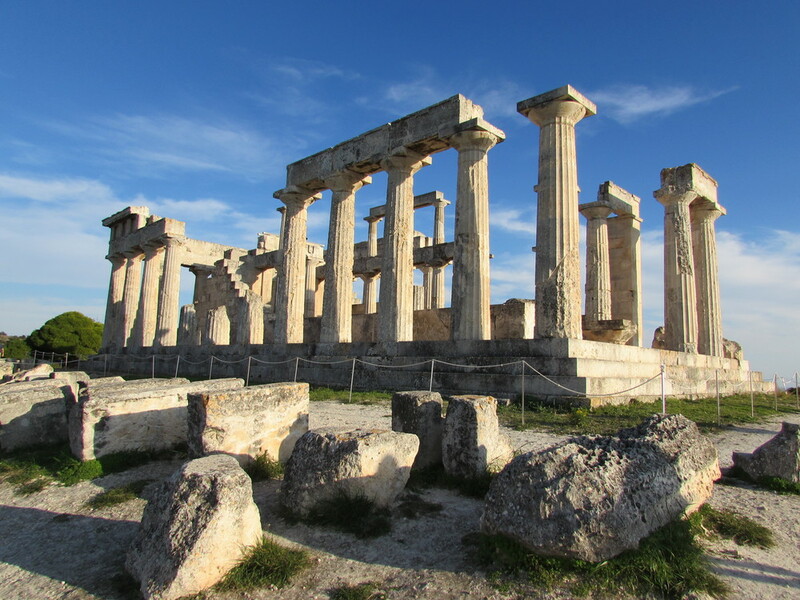 You can find out more here about a private tour to Corinth and Olympia. Visit Independently: There's no escaping the fact you are going to need a car if you want to visit Corinth and Olympia on a day trip from Athens! In reality, you would probably want to stay the night at Olympia. You could then tie it in with seeing some other places of interest on the Peloponnese. Somewhat randomly, I took some tourists on a 2 day tour of the Peloponnese, which included a trip to Olympia (this is not something I normally do!). You can find out more here – My 2 day tour of the Peloponnese. Now, I am not going to lie to you, Meteora is a LONG way from Athens. This is going to be a really full-on day trip, with a lot of time spent on a train or in a car. If it is your only chance to visit Meteora though, I strongly suggest you give it a go. Meteora is a UNESCO World Heritage site situated in central Greece. It is famous for its monasteries which are built somewhat precariously on the top of huge rock pillars. This is an area of Greece where nature and man have connected harmoniously.The views and scenery are simply incredible. Due to its northerly location, this is the longest of the day trips from Athens, but still very possible. Visit Meteora on a tour from Athens: If you have to visit Meteora as a day trip from Athens, an organised tour is better than doing it yourself. There are a number of tours are in operation, and they mostly include a train journey to reach the area. This tour is a typical example – Meteora tour on train from Athens. Combine Delphi and Meteora: Another good option is to take a two day tour from Athens that combines Delphi and Meteora. Visit Meteora Independently: The most sensible option is to hire a car in Athens, and drive to Meteora. This way you will have the use of the car to drive around the area, which I highly recommend. I have written several articles about Meteora which you may find useful, including Meteroa – Mountains, Monasteries, and Monks. In my opinion though, you would be better spending the night at Meteora. I've put together a useful list of hotels near Meteora here. My Newsletter – I'll share the best of the best blog posts about Athens with you. No spam. No BS. Sign up here. Sightseeing in Athens – My 2 days in Athens itinerary has proven to be very useful for hundreds of people! Accommodation – If you are looking for accommodation in Athens, I have put together this guide to the best hotels near the Acropolis. Museums – Athens has over 80 museums to choose from! The most popular are the Acropolis Museum, and the National Archaeological museum. This is a full list of all the museums in Athens. The best places to see in Greece on a road trip – If you want to go beyond choosing from individual day trips from Athens, maybe a road trip is more your style? This huge resource will help you plan the ultimate Greek road trip. 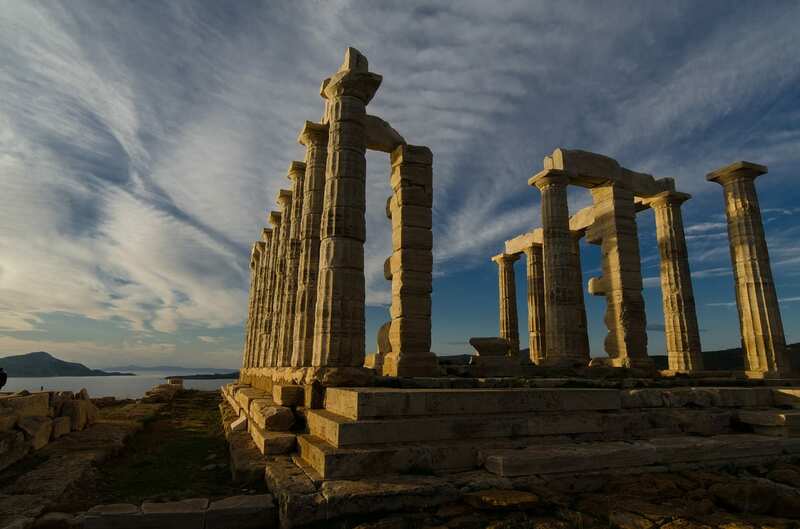 Temple of Poseidon – Some more information about the Temple at Sounion. If you are looking for more Greek itinerary ideas, then you will find this post useful. Which one would you do if you only had one day to do a day trip ? That’s an easy one to answer – Delphi! Each of the Meteora monasteries has to be walked up (no elevators!). It should be within the capabilities of a fit 73 year old planning a trip to Greece for sure! Just take it at your own pace. I would suggest that you use some for of transport to get between each one. You could drive if you are taking a hire car, or take the day tour (as suggested in article). If you are planning to visit both Delphi and Meteora, then perhaps a two day tour from AThens that includes them both would be better than two individual day trips from Athens – there would be less time spent on buses. If you are hiring a car, then definitely visit them both over two days. That is a wonderful and great informative post for day trips from Athens. Delphi has always interested us and now Meteora too. Those monasteries on the huge rock pillars are so fascinating. These are all exciting suggestions for day trips. My pick of the lot would be Delphi. I am really fascinated by Greek mythology and culture. The place of the famed Oracle would be a great place to explore and lose oneself in the maze of time. I would love to visit Cape Sounion and Temple of Poseidon, sounds like a beautiful road trip out there too. And I’ve heard great things about each of Hydra, Poros, and Aegina, though didn’t realize you could combine them all on a three island day tour, so thanks for that tip! Delphi is also on the list, as are the monasteries in Meteora, though I didn’t realize you could technically make this into a Athens Day trip, as long as it would be. I think renting a car would be a good option for me. Thanks for the tips! I need to go to Meteora! I was in Athens over the summer but, never made it out for day trips. You’re right though it is the perfect location to visit the big sites in Greece. There is so much to see it’s overwhelming! I did all of the day trips you mentioned in this post (although I did them as one giant loop) when I was in Greece, except Meteora. I had no idea that it was so close to Athens! I also missed Hydra – it was on the itinerary for the day, but the water was soooo choppy we had to turn around after the second island. Huge bummer since it’s supposed to be super quaint! I love visiting islands, so the day trip from Athens to the nearby islands of Hydra, Poros and Aegina is totally what I would be doing. Thanks for the tip about supplying your own food and drink too. I live and work in a very touristy part of the world and am always surprised by those tour operators that charge a fortune on top of the already expensive ticket for basic things like water. I’ve heard many wonderful things about Athens, a chef I worked with a million years ago said Athens serves some of the BEST food you will ever eat! Better get on a visit! 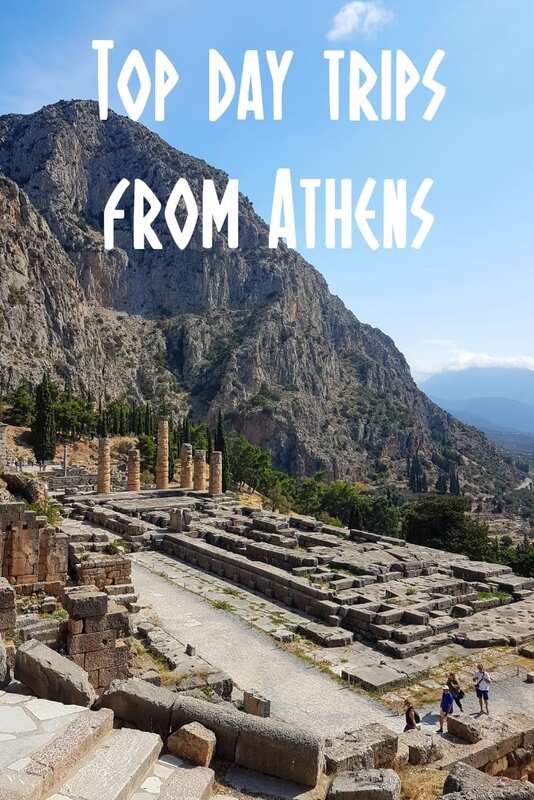 Basing yourself in Athens for a few days is a great way to see even more of the highlights of the country, especially on such day trips from Athens as a trip to Delphi! So what you are telling me is that when I plan my trip to Athens I need to add another week to take these awesome side trips to Delphi & Meteora and the islands…haha! Ok fine lets add another week! But seriously I know of Delphi but it wasnt much on my Greece Bucket List but the more I read about it the more I really want to see the ruins and learn more. Great pics by the way. 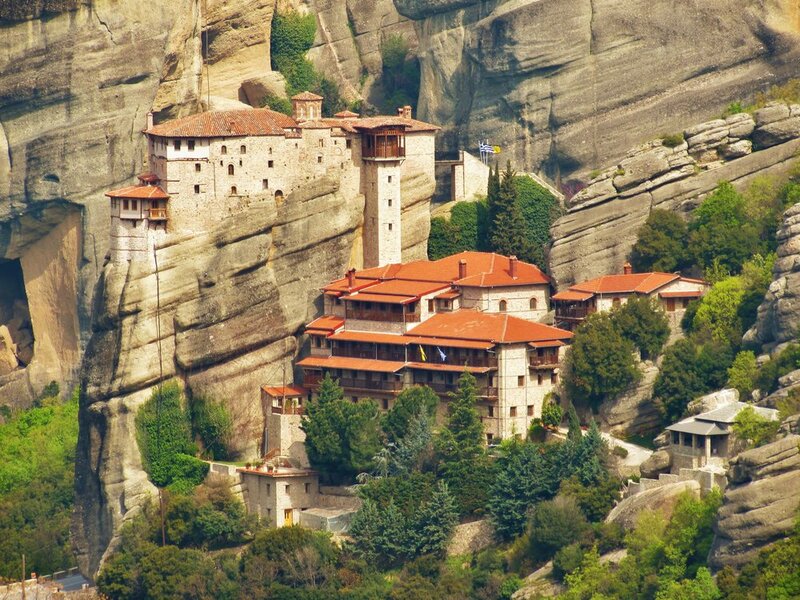 The monasteries at Meteora are a great place to visit in Greece. Whilst you can do it as a day trip from Athens, it might be better to spend one night there, so you get the benefit of seeing them over two days. You should be able to squeeze in a sunset and sunrise that way as well!